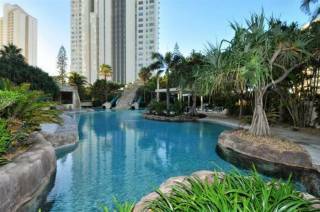 Nestled amongst beautiful waterfront homes on the Nerang River you will find a secluded piece of accommodation paradise. 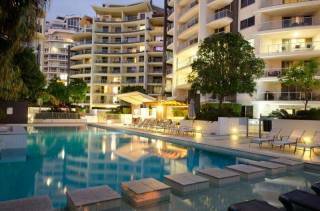 With easy access into Surfers Paradise which is only a 20 minute walk or 5 minute drive, just a 2 minute walk to private Regatta Parade Beach for a picnic or swim, or a 10 minute walk to Gold Coast City Council Evandale Park for a free BBQ, fresh water lake swimming, playgrounds, exercise equipment trail and offering beautiful views of Surfers Paradise. The cities Gold Coast Arts Cente is also located here with movie theatres, live entertainment and cafe for your enjoyment. Why not enjoy a dunner and the current international show? 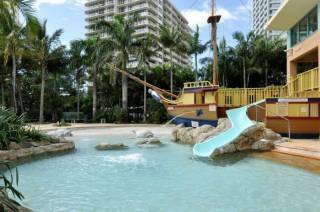 Local shopping centres, restaurants and bars are also walking distance to both Chevron Island and Southport Park shopping centres. Your accommodation is a two bedroom apartment, boasting a brand new kitchen with all new appliances, including microwave, oven, and fridge. The kitchen, dining and lounge are all in the one room which has air conditioning and there is a TV, DVD player and Wii for your use. Off the front door is a timber deck perfect for evening drinks and nibbles or a BBQ. You can enjoy a beautifully renovated bathroom with separate toilet, large laundry with new washing machine and exit to outside private clothes line. The bedrooms both have queen beds and ceiling fans, wardrobes and chest of drawers. The lounge in the dining area can convert to a bed which also sleeps 2. The villa is totally private from the main residence and has been soundproofed for your privacy. 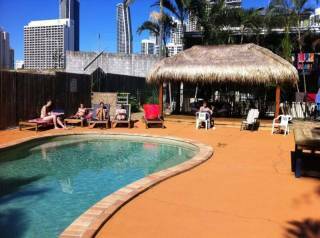 All that's waiting is YOU to come and enjoy a well deserved holiday on the beautiful GOLD COAST!!!!! !